Sometimes you have to take a step back, remove yourself from the moment, and try to ground yourself in what is true, elevated, even eternal. Let’s do that. The week has lent itself to a feeling of instability. The president has deliberately added to the rancor and tension of his nation’s daily life, lurching in his tweets from mischief to malice to a kind of psychopathology—personal attacks, insinuations, videos from a group labeled racist by the British government. You always want to say he has reached peak crazy, but you know there’s a higher peak on the horizon. What will Everest look like? He has no idea how to be president. More men of the media have fallen in the reckoning over sexual abuse, most famously a bright, humorous, ratings-busting veteran anchorman, who reportedly had a switch on his desk that locked his office door so he could molest the women he’d trapped inside. He had no idea how to be a man. 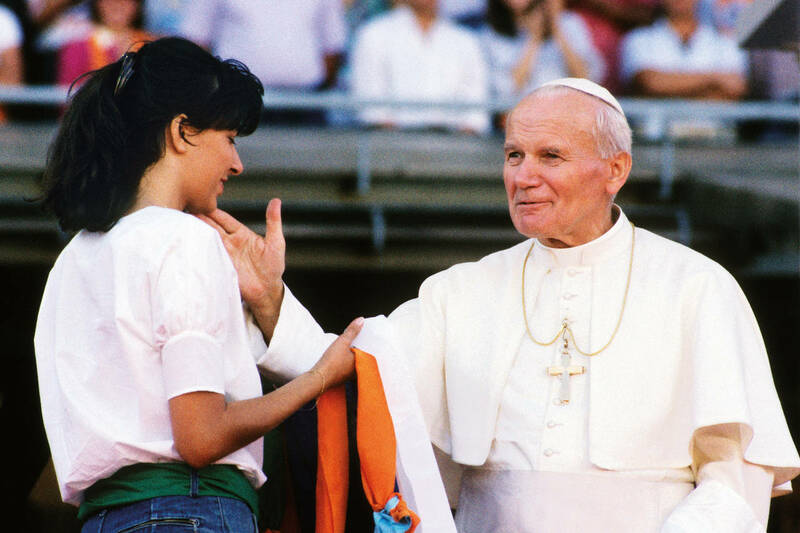 Pope John Paul II during a meeting with young people in Turin, Italy. There is more, and I urge you to read it, but it is a very modern document, a feminist statement in the best sense. When a friend sent it this week and I reread it, what I thought was: If all the now-famous sexual abusers had ever pondered such thoughts (as opposed to parroting them on the air before flipping the switch and locking the door) and considered questions of true equality, they never would have done what they did. They wouldn’t have been able to think of women as things, as mere commodities to be used for imperial pleasure. They would have had to consider their dignity. At the heart of the current scandals is a simple disrespect and disregard for women, and an inability to love them. This would be bad. America takes place in the office, and anywhere America takes place there will be the drama of men and women. It is not wrong to fear it will become a dry, repressed, politically correct zone, no longer human. But the way I see it, what’s happening is a housecleaning that’s long overdue. A big broom is sweeping away bad behaviors and bad ways of being. It’s not pleasant. If you’re taking joy in it, there’s something wrong with you. The trick is to leave the place cleaner, not colder. Common sense will help. Offices aren’t for 10-year-olds but for adults. Deep down you know what abuse is: You can tell when someone’s taking or demanding what isn’t his. By adulthood you should also know what friendliness, appreciation and attraction are. But it comes down to whether someone is taking or demanding what isn’t his. As for unjust accusations, it is true—they will come. Just accusations used to be ignored; in the future unjust ones will be heard. Here the press will be more important than ever. They have just broken a scandal through numbers and patterns—numbers of accusers and patterns of behavior. If journalists stick to this while also retaining their deep skepticism and knowledge of human agendas, things will stay pretty straight. So far, American journalists have been sober and sophisticated, and pursued justice without looking for scalps. Human-resources departments will have to operate in the same way—with seriousness and knowledge of human nature. My concern is something else. It is that young women, girls in high school, young women in college and just starting out, are going to have too heightened a sense of danger in the workplace, too great a sense of threat. But there are more good men and women out there than bad. There are more good ones than bad.